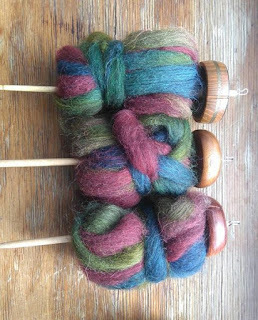 For the second year running, I have been part of Team Handspinning News UK for Spinzilla. Although we're spread all over the UK, we have a rather good camaderie going over on Ravelry, and we had such an excellent team spirit going last year that we all signed up, en masse, for this year's team. I was rather looking forward to making a serious attempt at some mileage, but then work decided that there was overtime available - for one week only. And as I was short of holiday anyway (these wool shows really eat into holiday) I offered to work an hour and a half extra each day, to add up to a day in lieu by the end of the week. So I lost spinning time, and ended up over-tired too. I'd had a plan to try and spin a garment's worth of yarn on spindles over the week, but Spinzilla rather caught up on me. And I had a black Shetland fleece that I'd offered to spin up for Deb Gillanders of Propagansey fame, and very little inroad had been made into it, apart from getting it washed before we went on holiday to Somerset. So, I cracked on and got the fleece combed up the day before Spinzilla started - midnight on Sunday 2nd/Monday 3rd October. It's a fine, soft fleece, and took a lot of spinning. 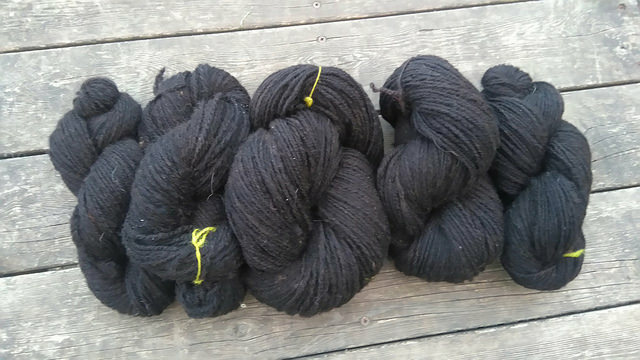 I ended up with about 1500m of this before washing (my spinning tends to make very elastic yarn - it's lost about 10% of length on washing, but gained bounce and cushiness). I did, however, manage quite a bit of spindle-spinning over the weekend. This is what I took to the cinema on Sunday afternoon, appropriately enough to see YARN the movie. Which was quite lovely and moving and inspiring - really I can't encourage people to go and see it enough. 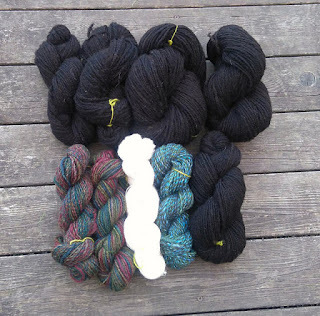 Three more or less equal weight spindles, and 50g of fibre more or less split between them. (The slightly bigger piece of fibre had the slightly heavier spindle, and that worked well). And there's two Bosworths and an IST spindle there. 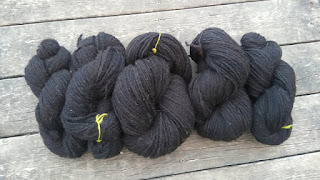 This was half a 100g of grey Shetland which I'd dyed in my Macaw colourway. (I'd done a special offer on this colourway on white or grey Shetland for other Spinzilla spinners) with a view to making a plain 3 ply yarn with it.The other half I wheel-spun and chain-plied. I'm doing a workshop on chain- or navajo-plying at next year's Wonderwool Wales, and thought these two similar yarns from the same fibre would be an interesting teaching sample. 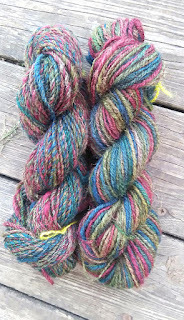 This is what I ended up with - you can see how clear the colours stayed in the chain-plied skein. Annoyingly, I think I spun one of the spindled thirds in the opposite way from the others, and didn't notice til I'd plied it. The perils of spinning in the dark! 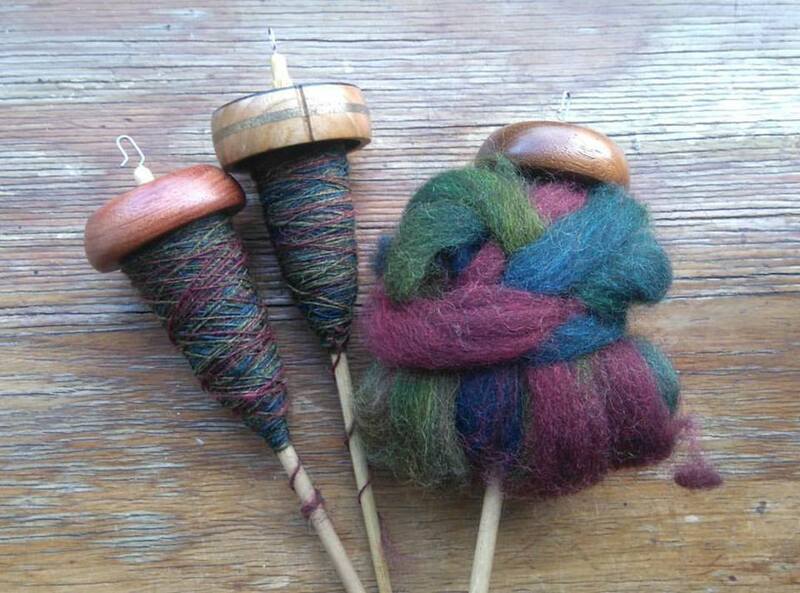 Three colours of John Arbon's blends, the bright blue one being a Spinzilla special for our team. All the spindled yarns were wheel-plied late on Sunday evening, even the white Wensleydale blend that I'd been doing in odd moments during my truncated lunchtimes this week. And by late, I mean that the final bit was whizzing through about five to midnight. My final yardage was 7063*, which equates almost exactly to 4 miles. I wonder how much I could crack through if I didn't have to go to work, and got perfectly organised and prepared beforehand? I'm rather pleased that the bulk of this year's Spinzilla yarn already has a home to go to. Some of mine from last year is still unused, though I turned a CVM fleece's worth of yarn into a hoodie-sweater in just over a week when I was on holiday in Somerset a month ago. You can get lots of knitting done on long car journeys - provided someone else is driving! Given that the two Macaw skeins are going to be teaching samples, only the white has no end use in mind. I was at a We Banjo 3 gig in Saltaire last night, and filled up two spindles with more of the John Arbon blends to make more of the blue/green yarn. *This is not yardage of usable yarn. 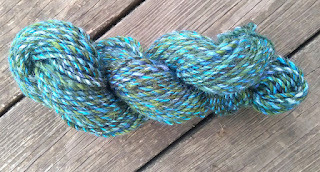 Spinzilla has a special system of measuring that allows for all the yarn spun and also the time spent plying singles together. So we claim for each single spun and the plying done.